Chandler Children want Christian Education! Currently, public schools in Texas are failing to educate our children in the fundamentals of Christian kindness and morality. The quality of education suffers due to the inadequate number of teachers, the ever-growing student to teacher ratio, and the lack of financial support for teachers in the classroom. In many schools, chaos rules the classroom. Our children deserve better and in Catholic schools they are provided not only a sound education but a caring, Christian environment. 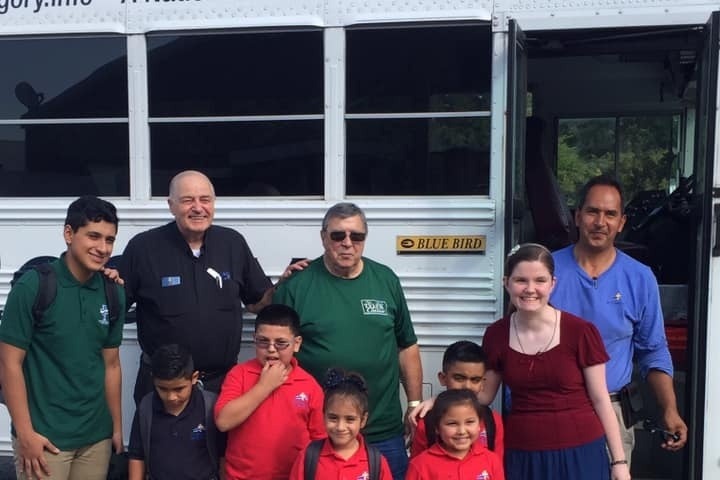 Children in Chandler, Texas are asking for help to attend Catholic schools in the Tyler area. This means tuition assistance and transportation to the campuses. St. Boniface Catholic Church is providing both, but we need help doing it!! Remember that discipleship is not just about SAYING we have faith and love for Jesus Christ, but also about DOING for Him….. helping the less fortunate by giving from our hearts and pockets. The seven children that we have helped so far are THRILLED at the wholesome and loving atmosphere of the Catholic school system. The academic routine is rigorous, but fair and fun; a good athletic program along with the arts, religion, math and science translates to a well-rounded education for our youth. The Tyler Catholic School system is well recognized for its outstanding academic programs, making it a perfect resource for nearby Chandler families. So far, we have sponsored seven children and provided transportation, free tutoring and after school oversight for them as well. The financial burden is shared with the parents and the school; the parents must also be active participants and meet with the pastor on a regular basis. The sponsored youth have spoken up in gratitude for their schooling this year and more parents in our parish have come forward with requests for help. YOU can sponsor a child or donate to the Tuition Assistance program for St. Boniface’s youth!! For each child, a total of $2500/year is needed along with $200/yr for bus expenses. For $50,000 we can add 11 more children to our program for 2019-20 and continue on for our current youth. We will be so thankful for any help in this endeavor!! Please don't let us and our children down!! 60 days Campaign -Tuition Assistance for St. Boniface Youth! !